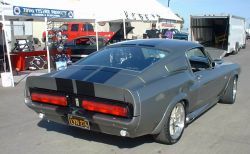 Our Coil-Over Conversion and Rack & Pinion Kits were used in a number of the 1967 Shelby GT500 clones used for the stunt sequences in the movie "Gone In 60 Seconds", starring Nicolas Cage. TCP Customers, Mustang Enthusiasts and Car Nuts in general should not miss this movie. If you didn't get a chance to see it in the theaters you should be able to find a copy at your local video store. Make sure to see our equipment in action! Cinema Vehicle Services (www.cinemavehicles.com) received one of our catalogs and our components were just what their stunt drivers were looking for. During initial testing of "Eleanor" the stunt drivers were victims of the ill handling of a '67 Mustang. Our Coil Over Suspension and Rack and Pinion Kits would be the cure for this vehicle's shortcomings. It was Spring '99 when they placed their first order for a couple of set-ups for testing. TCP went down to Cinema Vehicle Services in Southern, CA to oversee the installations on the first few cars. After the suspension and steering installations were completed it was on to Bob Bondurant's Driving School in Arizona for testing. 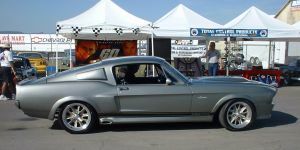 Our very own 1965 Fastback (featured in Mustang Illustrated April 2000 - Testbed Terror) was used to get the stunt drivers as well as the leading actor himself better acquainted with the new suspension and steering. As you can imagine stunt drivers are probably the ultimate test on a components strength and reliability. There were 11 cars built for the movie, most of which have our suspension, rack, and billet aluminum pedal covers installed. The improvement in handling is evident in the action sequences in the later half of the movie. Most 1967 Mustangs would have excessive body roll and fall short on some of the quick steering maneuvers the stunt drivers put these cars through. As they say "That's a wrap!" which concludes TCP's Hollywood experience, at least this chapter.